We're teaming up with Squarespace for a week of inventive DIY centerpieces, from classics with a twist to totally wild takes. We invited a few of our favorite designers and stylists to participate, so join us as they share their tips and tricks—and scroll down for a code to get 10% off a yearlong subscription to Squarespace. Today: Interior designer and stylist Paige Morse shows you how to style five eclectic centerpieces using objects she found in her own home. Paige uses Squarespace—check out her site here. I challenged myself to create five different table settings made from a collection of unexpected objects, and also sourced almost all of them from different parts of my home; finding new uses for decorations refreshes their impact. 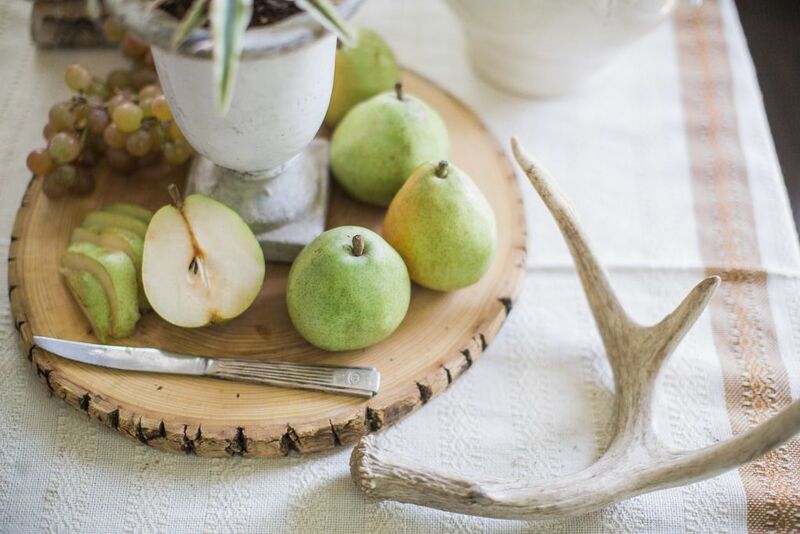 You can easily incorporate one or a combination of these found and foraged pieces on your next table. 1. Use paperbacks and a stick instead of crystal. 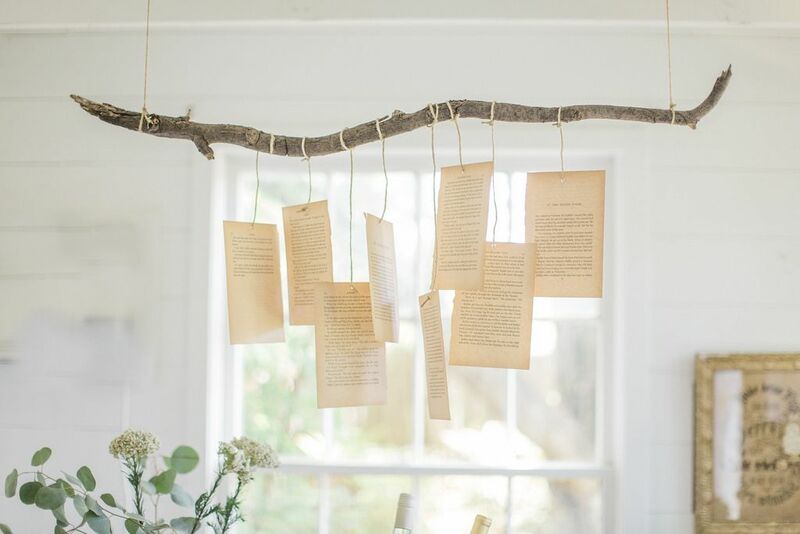 I wanted to build a vintage and foraged look with this chandelier, so I grabbed a sturdy branch from my backyard to start, and then (carefully) ripped out pages of an old paperback book, punched a hole in each page, and attached the pages to the wood with twine. I then suspended the branch from the ceiling. The pages will flutter around lightly even without a window open, creating the look of an all-natural chandelier for no cost. 2. Tie together a trio of glass bottles. 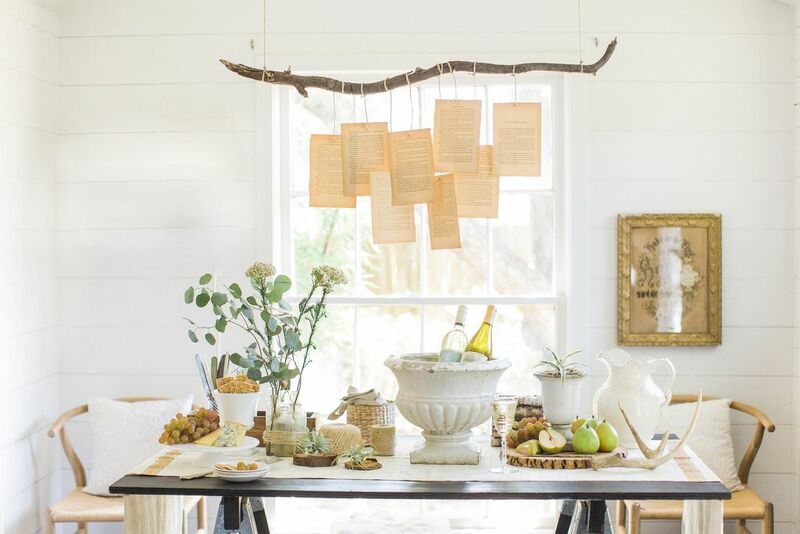 For this centerpiece, I took vintage glass bottles that I've collected and bound them together with twine. I wanted to have a wild and unexpected floral arrangement, so I paired eucalyptus leaves with seeded florals from my local market. I wanted to create some height with this option, so I left the stems at full length and arranged them casually in the vases. 3. 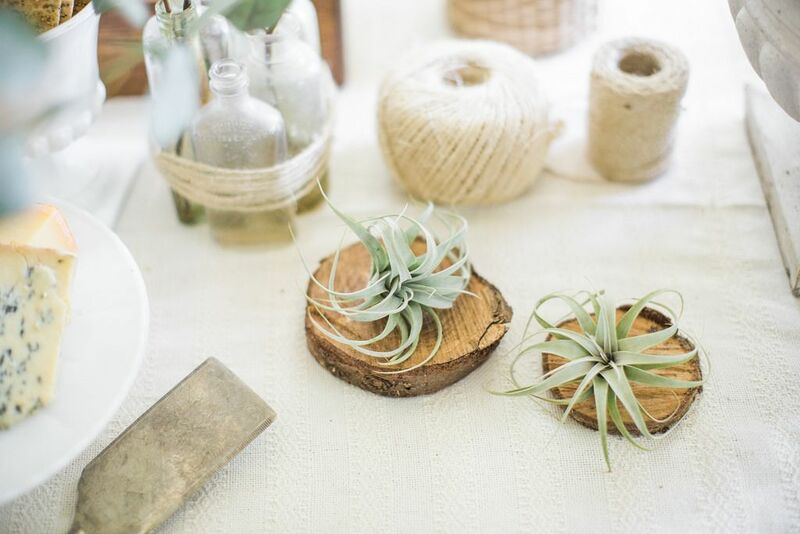 Give your air plants a pedestal. 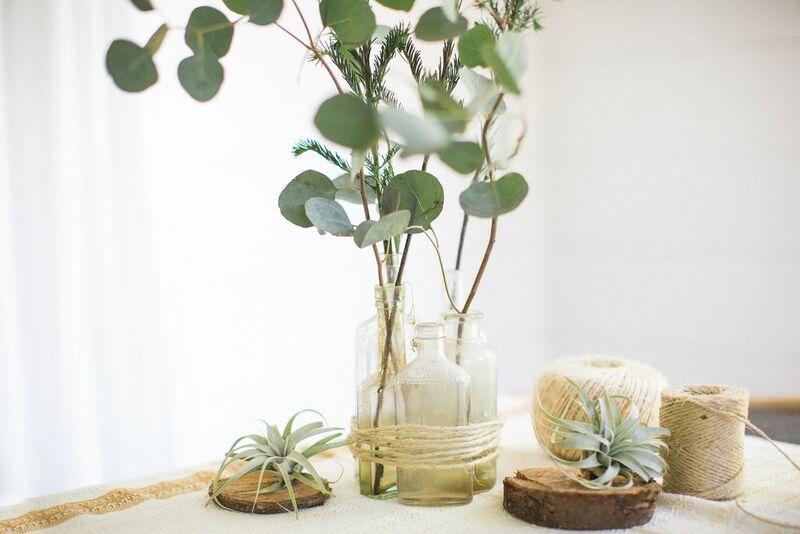 I like to create layers when making centerpieces, so, for this simple arrangement, I gave a few small air plants height by placing them on little wood coasters. The coasters are actually the bases of Christmas trees that were leveled off before they were sold! Ask for some next holiday season when you buy your tree. 4. Fresh fruit makes a simple, sustainable statement. Fruit and food are excellent low-cost arrangement pieces. I placed a small cement urn with a plant in the middle of a tree trunk cutting board and populated the tray with grapes and pears. Cutting some of the fruit exposes their pretty insides and encourages people to serve themselves. 5. No soil needed for a wine urn. For an unusual yet functional centerpiece, try using a large, decorative urn from outside—all you'll need to do is clean it out and add a plastic liner. 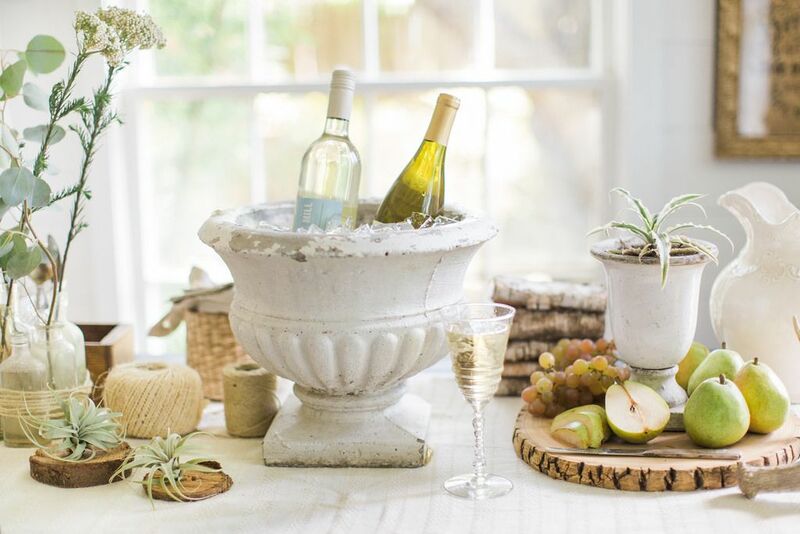 Fill it with ice, nestle in a few wine bottles, and voila: party in a planter. This article was brought to you by Squarespace. Use code FOOD52 to get 10% off a yearlong subscription to Squarespace. I’m Paige, a creative professional, interior stylist and design obsessed girl. People hire me to make things pretty – both for photo shoots and in their homes. I believe good photography and design is really about telling stories. I like the human element, and how things make you feel. I am always seeking the story in a project and how to translate that visually through my work.